Anemia is one of the most common disorders in medicine. Despite being a common condition, it is often misdiagnosed, mistreated and often poorly explained to patients. Anemia is popularly known as lack of blood. In fact, this concept is not entirely wrong, but we can be a little more precise. Anemia is a reduction in the number of red blood cells (also called RBCs or erythrocytes) in blood. Red blood cells are the cells that carry oxygen, delivering it to all organs and tissues of the body. To make it easier to understand, we explain what the blood is and what happens in it. The blood can be didactically divided into two parts: blood cells and plasma cells. Blood plasma is the liquid portion, corresponding to 55% of total blood volume. 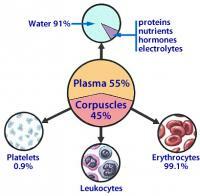 Plasma is primarily water (92%) diluted with some nutrients such as proteins, antibodies, enzymes, glucose, minerals, hormones, etc. The other 45% are made up of blood cells: red cells, white cells and platelets. Of these cells, 99% are erythrocytes. Anemia occurs when the percentage of red blood cells is reduced, making it more dilute (the reasons will be explained later). The diagnosis of anemia is basically done by measuring levels of red blood cells, accomplished through a blood test called CBC. In practice the measurement of erythrocytes is through the values of the hematocrit and hemoglobin. To understand how to diagnose anemia it is necessary to be familiar with the terms hematocrit and hemoglobin. What are the hematocrit and hemoglobin? Hematocrit is the percentage of blood that is occupied by red blood cells (RBCs). The normal hematocrit is around 40 to 45%, indicating that 40 to 45% of the blood consists of red blood cells. Red blood cells are produced in bone marrow and have a life of only 120 days. The old red blood cells are destroyed by the spleen (an organ located on the left in our abdominal cavity). This means that after four months our red blood cells are all being renewed. The production and destruction of erythrocytes is constant, so as to always keep a stable number of circulating erythrocytes in the blood. Hemoglobin is an iron carrier molecule that is found inside the red cell. Hemoglobin is the most important component of red blood cells because it is responsible for transporting oxygen in the blood. Iron is an essential component of hemoglobin. People with iron deficiency cannot produce hemoglobin, which in turn is required for the production of erythrocytes. Therefore, a decrease in hemoglobin necessarily leads to a decrease of red blood cells, or anemia. In practice the hemoglobin turns out to be the most accurate evaluation of anemia, since the hematocrit can be influenced by a more or less diluted blood. Therefore, we are facing an anemia when values are below the above given ones. Importantly the reference values can vary from one laboratory to another and results somewhat below normal are to be interpreted by the doctor, since they do not necessarily indicate the disease. Women with menstrual flow can have great values smaller than these without causing any harm to health. 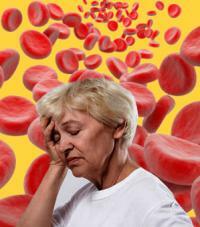 A mild anemia in women may not have clinical relevance. Well, having explained the basics, let's get to anemia itself. The MOST IMPORTANT CONCEPT TO BE LEARNED IS THAT ANEMIA IS NOT A DISEASE, BUT A SIGN OF DISEASE. When faced with a CBC showing anemia, the physician should investigate which of the three causes above is responsible for the framework. Do not just prescribe iron and think that's okay. A bowel cancer can cause bleeding and loss of red blood cells, leading to anemia. This is anemia caused by blood loss, and although the patient actually has iron deficiency, a simple replacement will not stop the bleeding or treat the tumor. Actually, replacement of iron without investigating the cause of anemia can improve hematocrit levels temporarily, leading to the false impression of solving the problem, which will only delay the final diagnosis. An infection that affects the marrow stops producing red blood cells, leading to anemia. In this case anemia occurs due to lack of red blood cell production in bone. Likewise, iron reset will not treat the cause. A drug that is toxic to red blood cells and causes their destruction before 120 days, also leads to anemia. Anemia by rapid destruction of red blood cells is also not to be treated with iron. Therefore, the simple diagnosis of anemia does not end the inquiry. Rather, it is only the first step to obtain the final diagnosis. If the patient has an anemia, there is an underlying cause. The iron replacement is indicated only in cases of iron deficiency anemia. Still, the reset does not eliminate the need to investigate which is causing the loss of iron. The patient may bleed by stomach ulcers, intestinal tumors, vaginal bleeding, etc. In fact, any disease that curse with chronic inflammation can inhibit bone marrow function and evolve with drop of red blood cells, a situation that called anemia of chronic disease. Therefore, any further slurred disease can cause anemia. In most cases, anemia arises due to illness, as in the examples cited above. However, there are also the primary anemias, caused by defects in the production of red blood cells themselves. The primary anemias are those that are not caused by other diseases, they are the disease itself. Just to reinforce the concepts: suffering from the primary anemia the patient has a genetic defect that prevents it from producing healthy red blood cells. The patient is born with this problem. In secondary anemia, the patient begins to show anemia after contracting a health problem during their life. NO! Anemia do not cause leukemia. In fact, anemia does not turn into neither leukemia nor any other type of cancer. However, as already explained, anemia can be a sign of the existence of cancer, including leukemia itself. Therefore, leukemia leads to anemia rather than vice versa. Because red blood cells are the carriers of oxygen in our body, the lack of them leads to the symptoms of a deficient oxygenation of our tissues. The main symptom of anemia is fatigue. 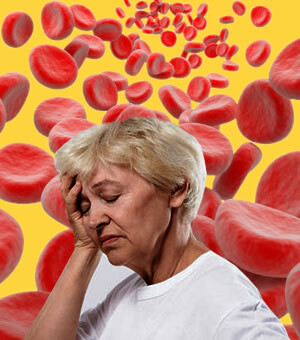 Anemia can be so severe that simple tasks like combing your hair or changing clothes become exhausting. The faster anemia settles, the more fatigue and weak the patient feels. Anemias that settle slowly give the patient time to adapt and can only cause symptoms in advanced stages. As an example, if the patient bleeds rapidly and their Hemoglobin drops of 9.0 to 13 g / dL within two or three days, the patient will feel a great fatigue. If on the other hand there is a small but steady bleeding, causing the hemoglobin dropped from 13 to 8.0 g / dL in three or four months, the patient may not notice much fatigue unless try more intense efforts. Another sign of anemia is pallor, often identified even by laymen. In patients with black skin, the pallor is difficult to identify. A simple way to identify anemia is looking the conjunctiva, the membrane covering the eye and the inside of the eyelid region. In normal people it is red. Already in anemic it is almost the color of the skin. Besides fatigue and paleness, other symptoms of anemia include palpitations, shortness of breath, chest pain, drowsiness, dizziness and hypotension. In the elderly there may be some loss of attention and difficulty in reasoning. As you might notice, anemia is a complex situation that may indicate dozens of different diseases. The important thing is to seek medical help whenever there is suspicion of anemia. Do not be satisfied only with the diagnosis of anemia and iron prescription for treatment. Ask your doctor what the cause of your anemia is and what is being done to diagnose it and treat it.